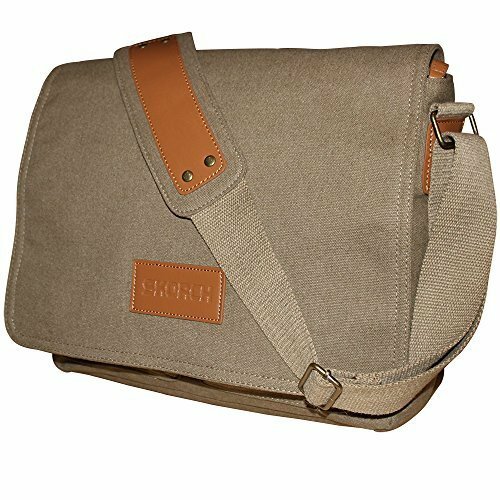 I just got this awesome messenger bag from SKORCH This is a really great and durable canvas bag. Very thick material that will not tear or unravel very easily. Seams are all really well done and secure. It’s a messenger style bag so it has a large flap that you can button over the front and there is a large shoulder bag you can easily carry the bag with. The strap is adjustable which is nice so you can adjust it to suit you comfortably. Lots of pockets inside for all your items, a spot for everything. I got this for my husband to carry all his stuff to and from work. It has spaces big enough for his laptop, tablet, phone, snacks, water bottle, and everything else. It’s a very simple style so he doesn’t mind carrying it. Very well made and works great for regular daily use. 6 x Internal and external pockets for phone, wallet and water bottles make this bag ideal for work, commuting or college. Can be worn on your front or back or as a crossbody bag. Multi-purpose bag which looks great in smart or casual environments. The thick cotton canvas material is a great durable alternative to leather. The classic design of this bag makes it popular among adults, teens, men, women, boys and girls, whether you walk, bike, drive, bus or train. The outer flap can be fastened closed for extra security or left to hang over the front of the bag. A wonderful and practical gift for Thanksgiving, Christmas, birthday or almost any other occasion. SKORCH messenger bags are available in black, blue and brown. Order now to see your shipping options. Related topics: Haversack, courier, messengers, men’s, women’s, travel, bookbag, cloth, duffle, office, teens, case, business, sachel, mailbag, student, utility.